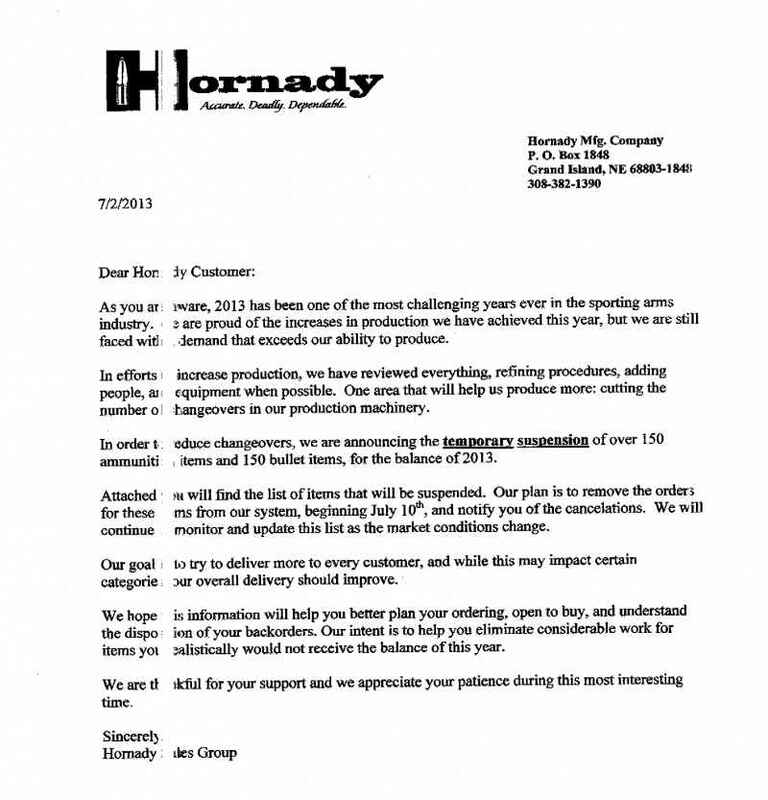 Hornady sent a letter to our shooting club and it was bad news, they are temporally suspending bullet manufacturing on 150 types of ammo and bullets for the rest of 2013! Here is the first page, I'll scan the other 3 when I return home later this afternoon. Do we have any "nuts" here from near grand island, nebraska? I'm thinking that I'm smelling something really stinky on this one!Hope that it's just me-but would like to hear from someone who lives close enough to hornady to actually hear whats going on from employees! I can't even imagine what type of business that would shut down operations in their biggest year of production/growth in history!Where are the bean counters and the bankers? The way I read it they are going to concentrate on only a few items to reduce downtime caused by retooling or resetting machines. This makes sense to me as it means more of a fewer selection of bullets. Those that shoot less popular calibers in both pistol and rifle may be unable to get bullets or even factory ammo for awhile. Thanks for that Omni!! I tend to use a few of those. 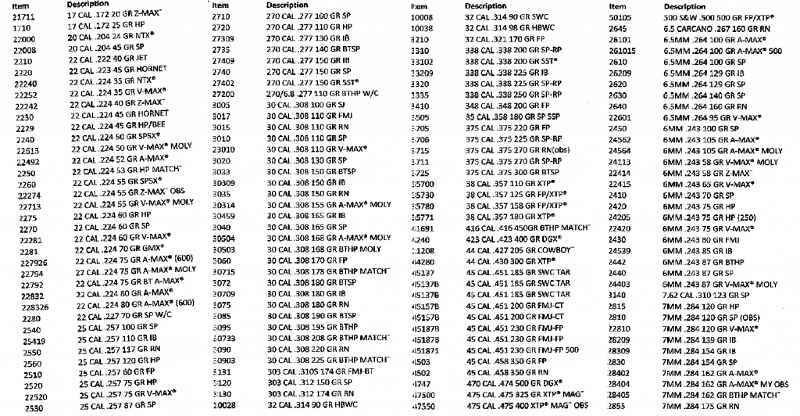 here are the scanned documents, lots of my favorites is suspended, wonder if other manufacturers will follow? Wow that is surprising. This hoarding mess is going to cause alot of long term problems I fear. Alot of people thought it would be resolved by summer but now its looking like it will still be around this time NEXT year. Crazy! I see some XTP's listed in there I use for muzzleloading... I better pick up a new box ASAP before they are gone! As MacD said, it looks like they are concentrating on the products with the most demand and suspending the lower demand items until they can catch up. Like Dallan, I need to peruse that list and see if I need to grab anything while I can! good on them for having the balls to realise there is a problem and try to sort it rather than loose custom by continueing with an ever increasing waiting list. 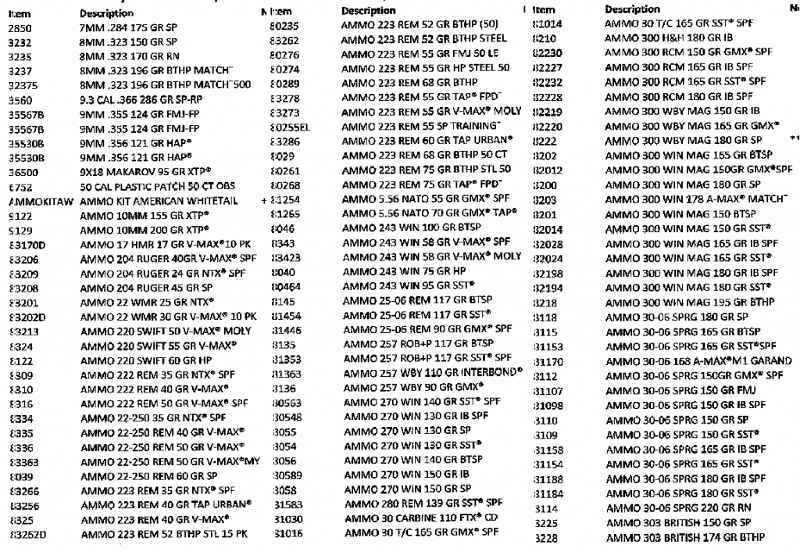 Taipan projectiles had an eighteen month waitng list 2 years ago and now you just dont see them listed anymore. 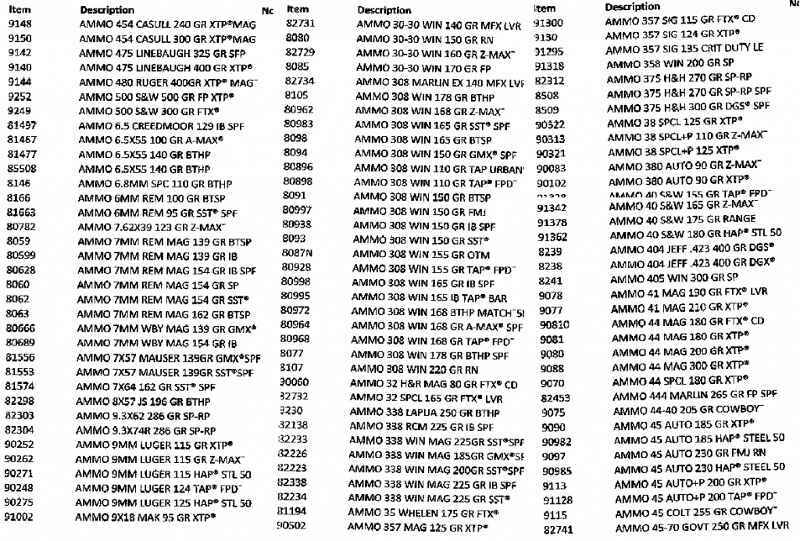 Blown away by how much hunting ammunition they are suspending production on... seriously, most of the popular loads for most of the popular calibers. What on earth are they focusing production on instead??? that would be a very good question to ask them. I'm believeing that it is "deeper" than explained!JMPHFO. I agree Trblshtr, they have the xtp line and the gmx line that are good sellers and they stop production! While my shooting club's president who has a gun-shop here in my town and is a distributor for Hornady cannot figure out why they would want to temporally cease production of popular selling bullets. Now we wait and see if any other bullet manufacturers follow suit, if they don't then it's most likely a production move on Hornady's part. If others follow suit, then something is amuck. I don't use any of their components but if they don't keep making them somebody else is going to have to take up the slack and that may cut into my supply. It seems odd that they would drop some of the most common hunting ammunition - that is like giving away your customers to your competition.